As many of you know, I have recently put up my 28mm Napoleonic collection for sale. I had put a lot of work into the collection over the last 10 years, but three issues kept on coming up.....storage, transportability and playability. After a lot of thought and some preliminary feelers, I put all but my Anglo-Portuguese and the Brunswickers up for sale. 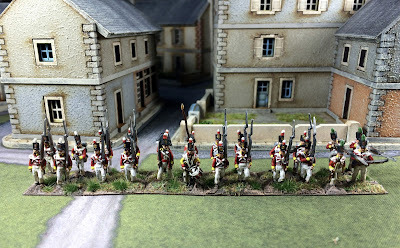 It has been pretty successful, with just 14 units of French Infantry left to go, and I have made enough to replace the 28 mm armies with three Divisions each of French and Anglo-Portuguese as well as a Spanish brigade with money to spare. 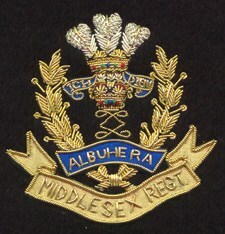 This includes several cavalry units as well as artillery and command. The new army will be all AB miniatures, based on metal stands of 6 bases per unit and are presently being painted in southern Europe and Asia. I have already accumulated a dozen units and more are on the way. A proportion of the funds are also been directed at a secret project that I will reveal soon, but the madness of a wargamer with funds to blow, knows no bounds. I am not a slouch though, so I have decided to paint up several bases of artillery which I hope to complete by the end of the challenge. 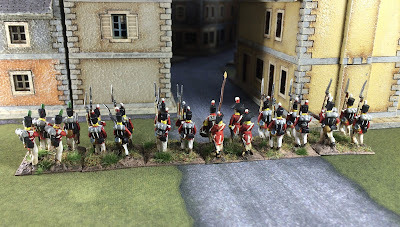 To get some practice, I have over the last couple of weeks painted up a British unit that I present here. I must say that the 18mm figures are quite challenging to paint and I am happy that I have just a few to do. I am still looking for a flag vendor, the Flagdude has unfortunately become unresponsive again, but I will remain hopeful as really he has the best flags. I plan to have a New Year post to discuss my 18mm OB, as well as to display the units I have already acquired. 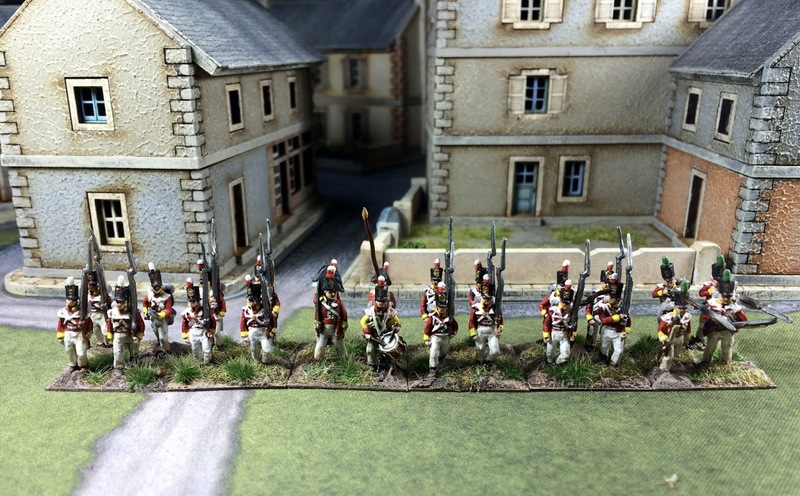 I think AB's are THE best Napoleonic's, they're a bit on the expensive side, but worth every penny. I shall look forward to the armies growing, John. Thanks ray, I am really chuffed by the plan. You've lost your soul now. There can be little hope once you begin to casually browse the catalogue and your mind begins to wander through the almost endless possibilities for allied units . . . .
No question I prefer your 28's, but I understand why you took the tough plunge to change scales, and the conversion looks like it's off to a good start. I look forward to seeing them in action soon! Nice work on them! AB Naps are certainly the best that 15mm has to offer. Almost as nice as 28mm, but what they lack in looks they definitely gain in usability. I've faced the same dilemmas as you with 28mm being hard to store and requiring massive playing areas to get a proper game going. I'd love to stick to the larger scale as they are much more fun to paint, but everyone in my club has migrated to smaller scales to allow for larger battles. Hi John, Welcome to the wonderful world that is 18mm. If you are still looking at flags, I would highly recommend the GMB offerings. Yes, I think I might go to GMB. The best of the season to you. I can understand what made you decide to go down to 18mm and the AB's are certainly the best out there. I'm sure the massed battalions will look stunning on the table. 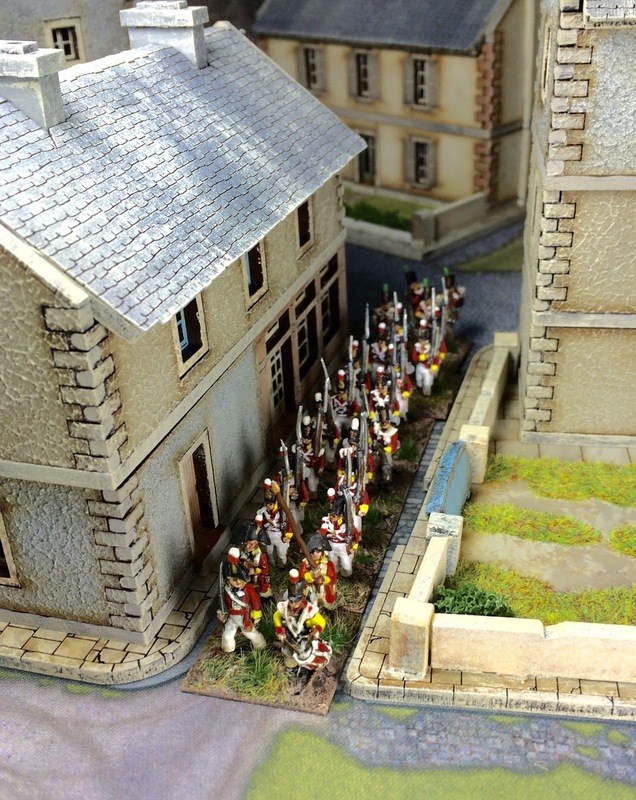 A big decision to change scale like that particularly after putting in so much effort on the 28mm front. I look forward to seeing your new armies. Personally I will stick with 20mm as a happy medium between the two other scales! Thanks, 20 mm is my choice for WWII. Hi John. While I'm sad that I won't get to see those wonderful 28's of yours in the future I am a big fan of AB's! 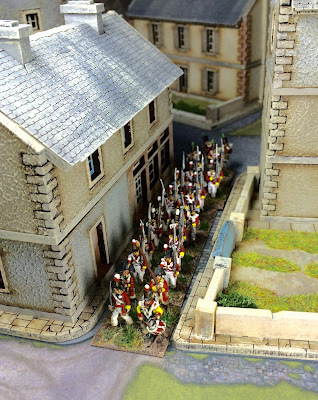 If I was to game Napoleonic's in anything other than skirmish (Sharp Practice) then the 18mm AB is the way I would go. They have the visual detail and appeal of 28mm figures but they also give you the benefit of a much bigger playing area. AB's (and in particular browsing the catalog) got me hooked and back into gaming and collecting again twenty years ago! Unfortunately I sold all my 18s but they are some of the best figures (and the biggest range) going. Perfect to feed your obsession! Yes, I have missed a couple of recent sales of painted AB's. wargamers are all crazy shifting back and forth! Nice brushwork John, great idea getting them painted, it's a long road!! !